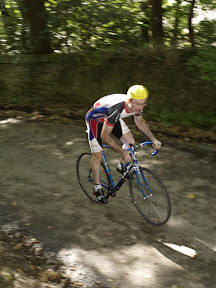 Paul Murphy was a convincing winner of the club hill climb championships, with a margin of 33 seconds over second placed Howard Heighton. Conditions were clear but cool as the club's main contenders for the championship all opted to drive out to the hill. In fact, Paul had been camping out overnight, having arrived directly from another hill climb the previous day. Howard and Roger were soon warming up on their turbos, whilst Paul and Ritchie were out on the road. The road surface on the hill was the worst for a long time. The foolds in September had washed mounds of gravel onto the road at the foot of the climb, and much of the rest of the climb had big holes in the road. Together with a damp surface, the course was more suited to cyclo-cross than a hill climb. The race was not without incident, as first man off Adam Wrightson came off his bike twice on the gravel / potholes, whilst Rob Hogarth unshipped his chain going for a bigger sprocket than he had! Further controversy ensued as the timekeeper mis-recorded Ritchie's finishing time. Roger Clarke and Adam Hogarth were once again almost level on time.